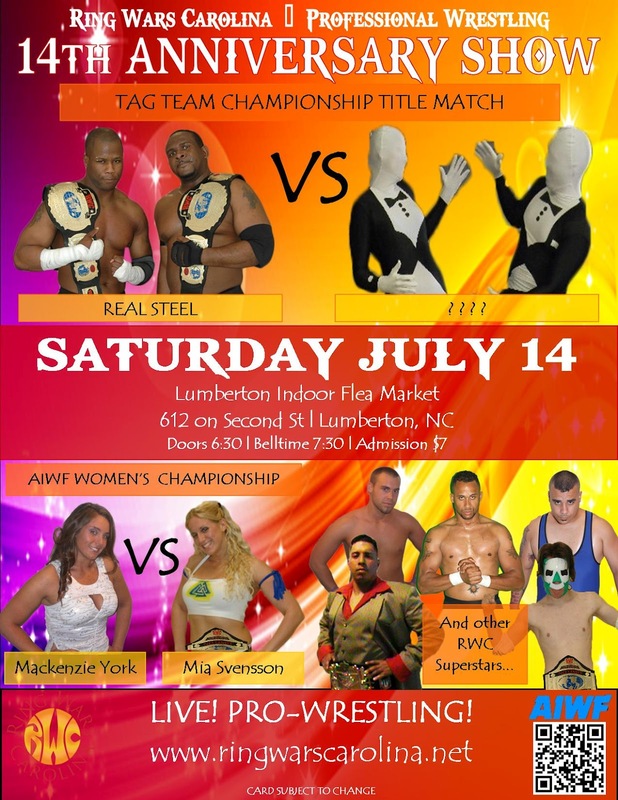 Saturday, July 14th Ring Wars Carolina will be celebrating their 14th anniversary. Come see what RWC has in store in Lumberton, NC. RWC Tag Team Champions Real Steel will be defending their Titles against "The Unknowns." Mia Svensson will be defending the AIWF Women's Championship against debuting Mackenzie York. RWC-favorite Hangtyme will be in attendance. Kris Nemesis will be defending the RWC No Limitz Title. Justin Overstreet will make his debut. "Dirty" Hector Sanchez returns from Puerto Rico - what's he have planned next? Come to celebrate RWC's 14-year anniversary with us. Saturday, July 14th at the Lumberton Indoor Flea Market: 612 on Second Street in Lumberton, NC.